Cookey09 had the most liked content! True Ford Enthusiast, I like the sound of that. 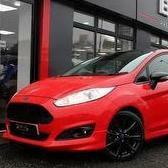 HI mate, no I didnt, I opted to chop my 1.0ecoboost in for a new st3 not long after my post... I have heard forscan is the way to go or if you have a mate or are friendly enough with any ford dealers/mechanics they should be able to do it for you if you tell them it can be done through forscan... I do know however that autobeam.co.uk do h15 LED bulbs now, which I wish were available for when I had mine, let me know how you get on with it mate. Fair enough. Looks like I have plain version then. Is it just a lottery if you receive one with the ST badge on? Not too fussed, just wondering. Thanks buddy! Caricature sketch I believe you’re talking about! if you fancy one done drop me a message mate. Cookey. Hi everyone!! Not posted on here for a while now, but still love this community! Just a quick post regarding something I’ve been doing recently - creating CARtoon style sketches of people’s pride and and joy. I’ve even had the end result printed onto a canvas board that is now noted as art in one of my customers garage! If any of you are on instagram you can check out all my work and edits on there and you may even fancy one of your own! Please be sure to follow my account https://instagram.com/purecarsuk (Alternatively search purecarsuk on instagram search) My account is currently set to private but please be sure to send a request! I can offer different prices for different amounts of work but don’t be put off as i’m sure you may be surprised as to the costing! Here are a few examples for you to see! (Before and after) If any of you are interested feel free to Message me on here or on Instagram! Thankyou! Cookey! Out with the old.. in with the new..
@pbenroh smart looking Focus you have there mate! Quick question, my brother has just got a 67 plate focus RS, but like yours, the puddle lamps on the mirrors are halogen yellow, does the plastic cap just pop off to change the bulb or does the mirror cap have to come off? And what bulbs sre used 501's? Cheers. New Owner - Fiesta ST-Line! Couldnt help you RE: 2 and 3, but i do know its possible to actually programme the car to lock its doors above the speed you desire. I can't remember how though... It is however through something that needs plugging and programming... im sure someone on here will point you in the right direction regarding this..
Not me. 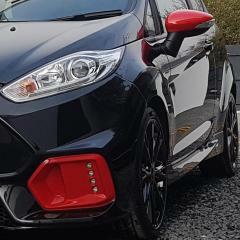 But my brother had his lower grille on his ST that he had painted gloss black by PaintModz, ripped out of his front bumper a month or two ago. They tried taking the gloss black fog surrounds too but couldnt as they wouldnt budge... It was outside our house in daytime! Shame we didnt catch them in the act!